The were two FEI rides at Euston Park today, marking the start of a busy season of FEI, national and other endurance rides to be held at the iconic Suffolk site this summer. A total of 45 started in the CEI1* 80Km and CEI2*120Km, in warm conditions on very dry ground following weeks of very little rain in the area. There was a finish rate of 58% and as ever prize money will be awarded on the judging of the Best Condition Award. Abdulla Ghanim Al Marri (UAE) secured first place in CEI2* 120Km, second place was Mohd Matar Rashed Al Mazrooei (UAE) and Salem Hamad Saeed Malhoof Al Kitbi(UAE) was third. The Best Condition prize was awarded to Afreet ridden by Mariam Adnan Abdulkarim Al Raid (UAE) which had finished the ride 5th. 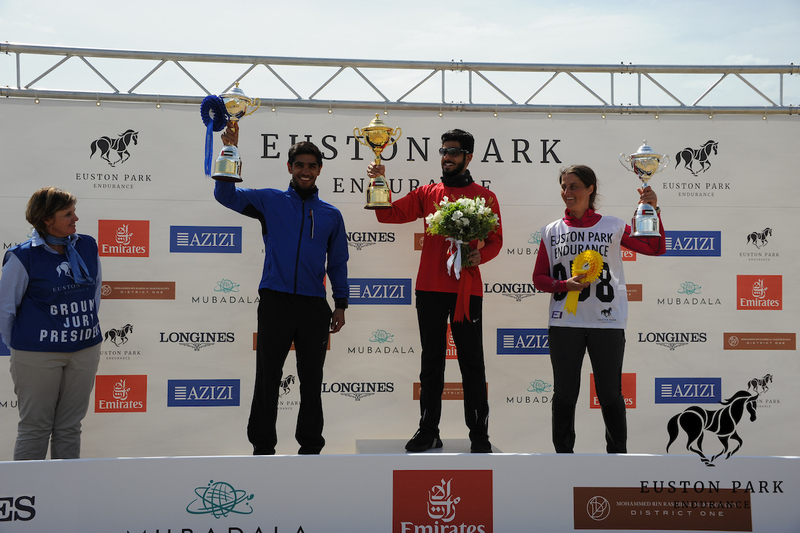 In the CEI1*80km Saif Ahmed Mohammed Ali Almazrouei(UAE) took first place, followed by Rashid Mohd Ibrahim Al Baloushi(UAE) and British rider Carina Kane took third place in her first FEI ride.